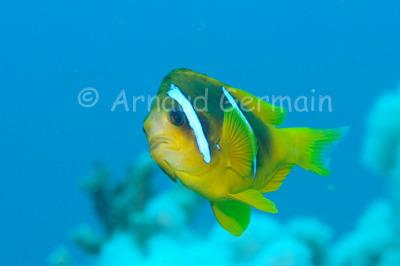 The problem with clown fish is not to get close to them. It is to prevent them from coming too close to the camera! If they were the size of a small shark, diving would be impossible as they are extremely aggressive fish that will not hesitate to bump into a camera or the fingers of a diver. I like the angle of this photo as the clown fish was hovering above his anemone. Nikon D700, Nikon 28-105 mm macro at 105mm, F8, 1/60th, ISO 400, Ikelite Housing and Ikelite DS160 strobe set on TTL +1.3EV. Shark Bay, Sharm El Sheikh, Egypt, about 20 metres down.